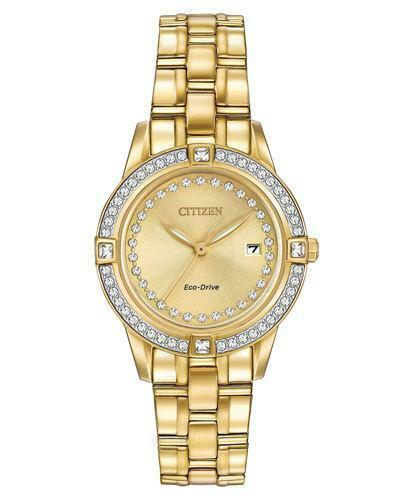 Citizen stainless steel bracelet watch. 29mm yellow golden IP round case with pav crystal bezel. Three-link bracelet strap with deployant clasp. Golden sunray dial with pav crystal detailing. Rectangular date window at 4 o'clock. Luminescent three-hand Eco-Drive movement. Splash-resistant mineral crystal. Water resistant to 3 ATM. Imported.